The ability to establish an attachment bond with a caregiver, an evolutionary process that keeps a child safe and nurtured, is a phenomenon that occurs naturally in all young children. Historically, however, children with autism spectrum disorder (ASD) were thought to be unable to form such bonds (American Psychiatric Association, 1980). This chapter describes the current research evidence on ASD and infant–caregiver attachment relationships. The chapter begins by providing an overview of attachment theory and assessment methods. It then reviews the history of thought around ASD and infant–caregiver attachment relationships, discussing the literature on the development of secure and insecure attachment patterns, the positive outcomes associated with secure attachment patterns, and factors influencing attachment formation in children with ASD. 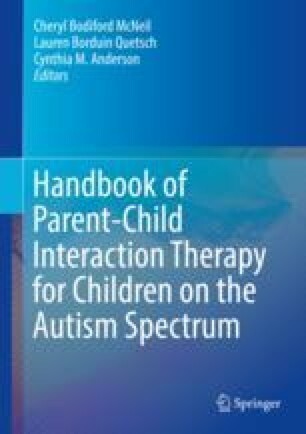 The chapter also explores the value of Parent-Child Interaction Therapy (PCIT), an intervention with theoretical underpinnings in attachment theory, as a treatment option for children with ASD and behavioral difficulties. Cohmer, S. (2014). Early infantile autism and the refrigerator mother theory (1943–1970). Retrieved from https://embryo.asu.edu/pages/early-infantile-autism-and-refrigerator-mother-theory-1943-1970.